The newly designed Altura Photo Navigator Backpack is a hybrid of both style and function. In a modern take on an old classic, the mock straps and classic tuck lock on the front flap are remixed details from the vintage satchel. The navy water-resistant nylon and the black strap detailing wipes clean and will show little evidence of your adventures. In addition to the large top opening, the Navigator features a discreet side panel door to access the bottom compartment without needing to take your bag off your back. Inside the compartment is a removable, slide-out camera insert with padded dividers. 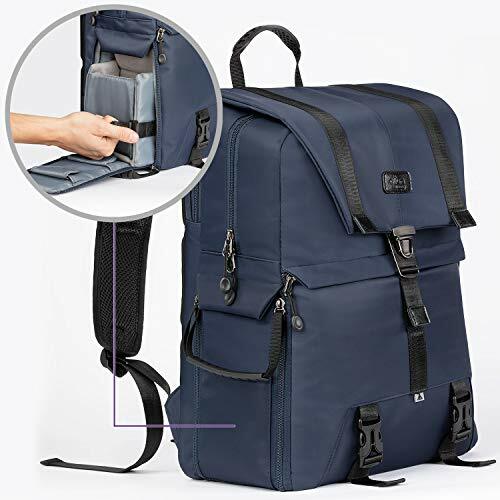 If you remove the main padded divider separating the top and bottom half of the bag the backpack converts into a full-size, every-day, multi-purpose backpack. Great for the office, gym or travel. Roomy, lightweight, stylish, durable and accessible. Adjustable straps with quick release buckles hold a tripod, yoga mat or umbrella. Right side has a stretch mesh pocket for water bottle, etc. You can also pack a folding changing pad and some baby gear, and it transforms into an undercover diaper bag. Well-padded body and shock-proof padded insert with adjustable padded dividers and a hand grip for sliding it out of the easy access panel door. – Plenty of additional pockets for accessories and smaller items: zippered pocket across front panel, zippered pocket under top flap, two flat vertical pockets inside top compartment, two small pockets with flaps and Velcro closure for smaller items like batteries, and SD cards inside the easy access panel. – Non-slip, reinforced bottom wipes clean. – Breathable 3D airflow padding on rear panel and straps keeps your back comfortable, cool and dry. – Stretch mesh water bottle pocket on side panel also has zip closure to hide when not in use. POLISHED STYLING AND ULTIMATE FUNCTION: In addition to the large top opening, the Navigator features a discreet side panel door to access the bottom compartment without taking your bag off your back. Inside the compartment is a removable, slide-out camera insert with padded dividers. MULTIPURPOSE EVERYDAY CAMERA BAG: Multiple pockets, straps, zippers and compartments all over make the Navigator a breeze to use. Holds laptops up to 17″. COMFORTABLE, CUSHIONED AIRFLOW PADDING: Back and Shoulder Straps have ‘air cell’ foam padding for added comfort, breathability and to help keep straps in place. ‘STAY CLOSED’ MAGNETIC CLOSURES: If you forget to zip or buckle, the magnets on the easy access panel and top flap quickly close to cover the open compartments.